Thank you very much to everyone who joined in our bridge building challenge last month, we loved reading through the posts. This month we’d like you to explore some kitchen science . If you don’t have a blog and would like to join in you could upload an image to one of our Facebook pages. The kitchen is a great place to explore science, as we demonstrated in the round up last week. My favourite chemical reactions in the kitchen are these fizzing rocks, which are super easy to make and so much fun. Making a colourful milk display. Remember to be careful when experimenting in the kitchen. Wash your hands when you finish and take care not to get anything in your eyes. 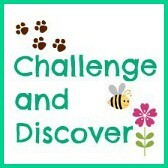 Challenge and Discover is in association with Inspiration Laboratories . « How does your garden grow? I think this month’s challenge is great! I love your list of 50 kitchen science activities – it’s the perfect place to look for ideas. I’m so excited! I’m linking up some old posts, and definitely am trying out some new ones as well. My boys are already asking to make ooblek dance again, as well as making egg geodes and rock crystals. I love these monthly inspiration themes! 🙂 Thank you so much for hosting! Thanks for hosting (glad I found it)! Sorry i liked up so many posts; I really did try to limit it!